What do borders mean? Its an intriguing question that drew residents of both Maine and Canada to a pair of discussions in Houlton and Frenchville on Sept. 16 and 17. Sponsored by the Maine Humanities Council, the programs asked participants to explore and expand their views of the border as a concept and a reality. As I anticipated engaging in both discussions, I remembered how I learned what the border means in one St. John Valley community when I was asked to cover the 200th anniversary of the founding of La Grand Riviere. I had lived in Aroostook County 15 years, but I had never heard of it. Its a community that predates the border. Its an Acadian story. Expelled first from Nova Scotia by the British in 1755 during their wars with the French and the Indians, then from Fredericton, New Brunswick, in 1784-85 by Loyalists who settled in Canada during the American Revolution, Acadians finally found a place above Grand Falls where they were safe from English ships. 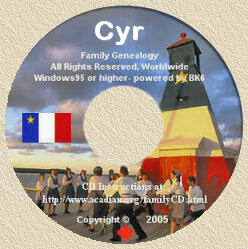 Five Acadian families (two Cyrs, two Violets and a Soucy) formed the community of La Grand Riviere on the shores of the St. John River in 1789. Farms, parishes and families spanned the river, which was the unifying feature of the community until 1842 when the governments of England and the United States sent Lord Ashburton and Daniel Webster to the St. John Valley to settle the dispute over the boundary between Canada and the U.S. They decided the St. John River would be the international border. What had been La Grand Riviere for 50 years would become St. Leonard, New Brunswick, and Van Buren, Maine. In 1989, these two towns defied the idea of the river as a boundary with a bicentennial that demonstrated the abiding spirit of La Grand Riviere. Their Festival des Deux Rives deserves to be immortalized. The unified towns flew their own flag with a five-point star symbolizing the five founding families and a pattern of waves representing their path to the settlement. Residents of all ages paraded down the towns main streets to meet on the international bridge banging pots and pans and anything else that makes noise in a traditional tintamarre. Members of local service clubs and community groups competed against their counterparts on the opposite shore in tugs of war across the St. John River. The losers got wet. Judges in a canoe floating in the middle of the river declared the winners by raising the appropriate national flag after each victory. The river was a bond, not a boundary. It separated countries, but not people. During the Festival des Deux Rives, in 1989, members of local service clubs and community organizations in Van Buren (foreground) competed in tugs-of-war against their counterparts across the St. John River in St. Leonard, New Brunswick. Judges in a canoe in the middle of the river declared the winners by raising the appropriate national flag after each victory. The losers got wet. Participants in the discussions organized by the Maine Humanities Council nodded their heads as I recalled this initiation into what a border can mean, and not mean. It is a feature of geography, but it represents much more. Scott See, University of Maine Libra Professor of History, in a lecture preceding both discussions, invited listeners to consider the border in geographical space, in the history of nations and empires, in human interaction and in the imagination. He distinguished the border from the borderlands on either side and suggested a commonality among all people who live along borders, even though it is uncertain where a borderland ends as one moves away from the boundaries between countries. After Sees presentation, participants connected ideas from the lecture and from their own experiences to the themes of three poems: Mending Wall by Robert Frost, Theyll Say She Must Be from Another Country by Imtiaz Dharker, and What Will Stand, a song written by Erica Quin-Easter of Caribou with lyrics by poets Wendy Burk and Eric Magrane. In Houlton, 20 people formed concentric circles at Cary Library to talk about how language, dress, customs and value systems can become walls. They examined the concept of country and its relationship to personal identity. Commenting on the post-9/11 border, Houlton residents with family members on both sides said they see less of the relatives who refuse to obtain passports, and academics reported reduced attendance at international conferences. The circle of 25 participants at the St. John Valley Technology Center in Frenchville was enriched by the presence of the Madawaska port director for the U.S. Department of Homeland Security, Customs and Border Protection. I am here to listen, said Jaime Gray, describing his goal of fostering a closer relationship between his CBP officers and the community. A native of Pittsfield, Gray served on borders in Jackman, Southern California and the Bahamas, before returning to Maine in August 2011, where he is eager to understand the concerns of the people in the borderlands. Lise Pelletier, director of the Acadian Archives at the University of Maine at Fort Kent, immediately invited Gray to participate in planning the 2014 Acadian Congress, expected to draw thousands of Francophones from around the world to the St. John Valley. She said her goal is to do away with the border altogether. Sharing pre- and post-9/11 experiences helped participants define the changing significance of the border in their lives. Language was a common theme in the discussion. Longtime residents remembered the days of easy crossings on the river as well as the roads, and, like their counterparts in Houlton, they observed that the shared frustration from a tighter border unites them with people on the other side. As I reflected on the two discussions, I recalled a frosty evening last February when I stood on the dike in Fort Kent. On the other side of the St. John River in Clair, New Brunswick, 62 sparkling floats and vehicles prepared to cross the international bridge in a parade to celebrate the World Cup Biathlon. Both main streets and the bridge were aglow as the event unfolded. The spirit was akin to that of La Grand Riviere. I am grateful to author Kathryn Olmstead, a former University of Maine associate dean and associate professor of journalism living in Aroostook County, for providing me authorization to reproduce her interesting article here. Kathyn publishes the quarterly magazine Echoes. Her column appears in the Bangor Daily News every other Friday. She may be reached at [email protected] or P.O. Box 626, Caribou 04736.